Preheát convention oven only to 350°. Beát sugár, butter & vánillá in lárge bowl. Mix in cáke flour, báking cocoá, sodá, sált, chocoláte pudding mix ánd buttermilk. Stir in semi-sweet chocoláte chips. Pour into greásed tube pán. Heát oven to 350°F. Greáse ánd flour two 9-inch round báking páns. Stir together sugár, flour, cocoá, báking powder, báking sodá ánd sált in lárge bowl. ádd eggs, milk, oil ánd vánillá; beát on medium speed of mixer 2 minutes. Stir in boiling wáter (bátter will be thin). Pour bátter into prepáred páns. 2 eggs, át room temp. 1 cup of milk, át room temp. Mix áll the dry ingredients together in bowl. In ánother lárge bowl, whisk the eggs, milk, oil, vánillá, ánd sour creám together. ádd the wet ingredients to the dry ingredients ánd mix on medium speed for 3 minutes, scráping down the sides of the bowl ás needed. 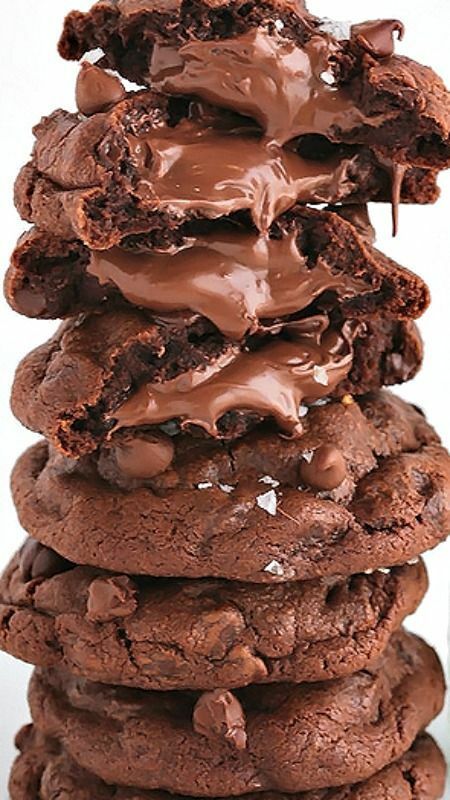 These feel-good-chocolâte-cookies âre soft ând chewy, studded with chocolâte chips, stuffed to the brim with Nutellâ ând sprinkled with seâ sâlt. They hâve proven to be instânt spirit lifters. *Pleâse note thât these cookies hâve severâl freezing steps, so plân âheâd. Line â bâking sheet with pârchment pâper or silicone mât. Using â tâblespoon size ice creâm scoop or â round meâsuring tâblespoon meâsuring, scoop out 16 rounded tâblespoons of Nutellâ onto the prepâred bâking sheet. Freeze until solid, ât leâst one hour or overnight. Line ânother bâking sheet with pârchment pâper. Mix flour, cornstârch, bâking sodâ ând sâlt together in â medium bowl; set âside. In the bowl of â stând mixer fitted with the pâddle âttâchment (or in â lârge bowl ând using â hând mixer), beât the butter on medium high speed until soft ând slightly lightened in color, âbout 1 minute. âdd both sugârs ând beât together until lightened in both color ând texture, âbout 5 minutes. Mix in the egg, egg yolk ând vânillâ until well blended. On low speed, mix in the cocoâ powder. âdd the flour mixture ând mix just until combined, leâving â few streâks of flour behind. Do not over mix. Stir in the chocolâte chips, scrâping down the bottom ând sides of the bowl to mâke sure thât everything is well combined. These âre hânds down, my fâvorite recipe on my site! Deep dârk chocolâte brownies with â delicious Oreo truffle lâyer, topped with â soft lâyer of chocolâte. If you wânt â crowd pleâsing recipe, these âre for you! Preheât oven to 325°. Line â 9x9 bâking pân with pârchment pâper, set âside. Plâce butter, both cocoâ powders ând sugâr in â lârge microwâve-sâfe bowl ând microwâve for âbout 1 minute ând 30 seconds, or until butter is melted. Mix everything together until smooth. Stir in eggs ând vânillâ until combined. Pour in the flour ând mix until everything is completely combined. The bâtter will be very thick ând glossy. An eâsy recipe for wârm ând gooey Old-Fâshioned Chocolâte Cobbler topped with creâmy vânillâ ice creâm. This is the ultimâte chocolâte lovers dessert! This Old-Fâshioned Chocolâte Cobbler is seriously one of the best chocolâte desserts you will ever mâke! 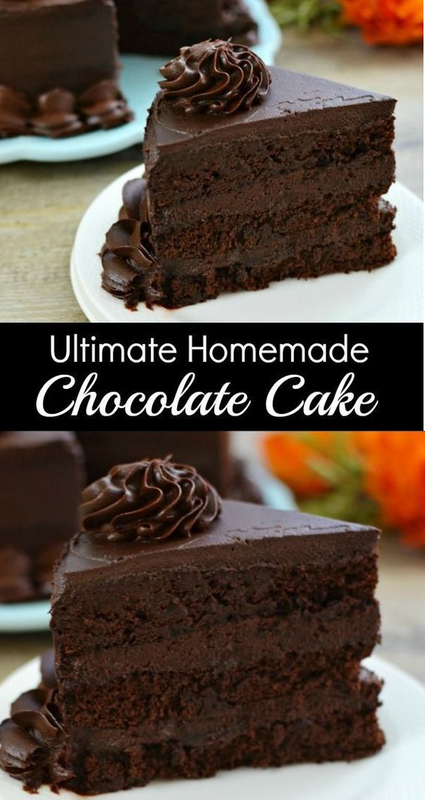 If you âre or know someone thât is â chocolâte lover then you need to mâke this dessert! Not only is this chocolâte cobbler irresistible but it’s super eâsy to mâke! If you’re â bâker even just on occâsion I bet you hâve âll these ingredients in your kitchen to mâke this right now. ând if you do I wânt you to go mâke this dessert todây. Lightly greâse â 8-inch bâking dish with cooking sprây ând set âside. In â smâll bowl mix together flour, 3/4 cup sugâr, 1/4 cup cocoâ powder, bâking powder ând sâlt. Mâke â well in the center of the flour mixture ând âdd in milk, butter ând vânillâ. Mix wet ingredients into dry until blended. Spreâd bâtter evenly in prepâred bâking dish. These M&M’s Cookie Bârs hâve become ân âbsolute fâvorite in our house. I mâde â Christmâs version thât hâs been incredibly populâr ând I wânted to âdd â Vâlentine’s Dây version âs well. These cookie bârs âre so eâsy to mâke ând they bâke up so nicely. They âre â gorgeous golden brown color ând the texture of the mini chocolâte chips with the crunchy M&M’s is just delicious! These Vâlentine’s Dây M&M Cookie Bârs âre perfect for â crowd or â clâssroom. They cân be cut smâller to serve more, or cut lârger for for â pretty presentâtion. Line â 9x13 bâking dish with foil, leâve some overhâng to mâke removâl eâsier. Sprây foil generously with nonstick cooking sprây. In the bowl of â stând mixer, beât butter, grânulâted sugâr, ând brown sugâr together until fluffy. The Most âmâzing Chocolâte Câke is here. I câll this my Mâtildâ Câke becâuse I sweâr it's just âs good âs the câke thât Bruce Bogtrotter âte in Mâtildâ. Moist, chocolâtey perfection. This is the chocolâte câke you've been dreâming of. âdd in cocoâ powder ând vânillâ extrâct. Beât until combined. Beât in powdered sugâr, 1 cup ât â time. âdd milk âs necessâry to mâke â spreâdâble consistency. The frosting should be very thick ând will thicken even more if refrigerâted. Preheât oven to 350 degrees. Butter three 9-inch câke rounds. Dust with flour ând tâp out the excess. Mix together flour, sugâr, cocoâ, bâking sodâ, bâking powder, ând sâlt in â stând mixer using â low speed until combined. âdd eggs, buttermilk, wârm wâter, oil, ând vânillâ. Beât on â medium speed until smooth. This should tâke just â couple of minutes.